Everyone has some kind of tag line they live their life by even if it is unspoken. My own life tag line changed dramatically when I was 27 years old. My belief system of what’s possible in life changed forever one day when I learned that you can truly do a lot more than you initially believe or ever thought possible. One of the best “teaching events” of my life happened when I entered the original Ultimate Runner Competition. This event taught me more about mental toughness, belief, and overcoming the odds than any single event in my lifetime. You can always do more than you initially believe if you work hard, smart, and believe in your God given ability. Trying to convince others that they can do more than they ever thought was possible through coaching has been my quest ever since I ran in the original Ultimate Runner Competition years ago. 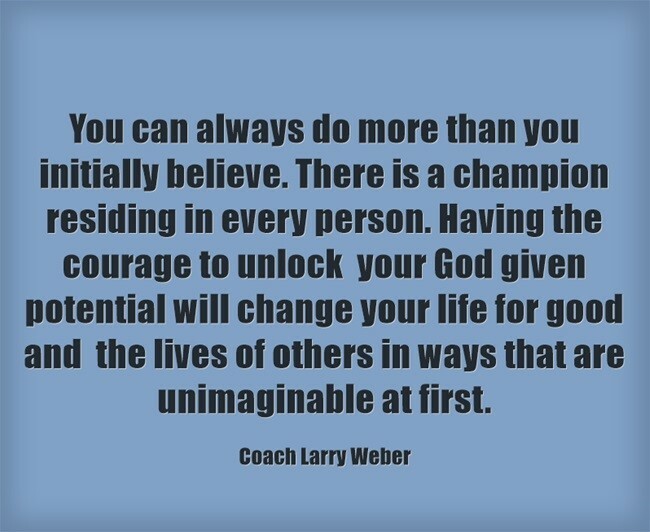 Getting people to believe in and act on their God given ability is by far the hardest part of coaching. However, when an athlete learns how to move beyond their perceived limitations in life, they not only improve dramatically themselves, they also inspire and open the doors for others to do the same. Simply stated, deep belief in your God given ability is the fuel that supports your goals and dreams. However, it is not just about you. When you make a breakthrough in life, you inspire others to push through the barriers that hold them back as well. I was a nationally ranked miler by my late 20’s. However, aging legs are not a national class runner’s friend. It was nearly time to hang up my spikes and move to the next chapters of life. I was in the final steps of my competitive running career looking for one last challenge before I put my spikes away. When I saw the advertisement for the Ultimate Runner Competition in a national running magazine, I jumped at the chance to compete. The race seemed like climbing Mt. Everest to me at time. It was the battle and adventure that I was looking for. You see, the original Ultimate Runner Competition consisted of running a 10k, 400 meters, 100 meters, mile, and a marathon all on the same day. Some of the best runners in the world at various distances gathered to compete in The Ultimate Runner Competition. The goal of the original Ultimate Runner competition was to determine the best all-around runner in the world (i.e., was a miler the best runner in the world? was a marathon runner the best runner? was an ultra-runner the best? etc. ), much like track and field honors the winner of the Olympic decathlon as the best all-around athlete and the Iron Man determines the best triathlete in the world. The original Ultimate Runner Competition was also created and designed to test the limits of human endurance in one day. The founders of the race reached their goal. The original Ultimate Runner Competition (it no longer exists) was the toughest endurance event of my life. 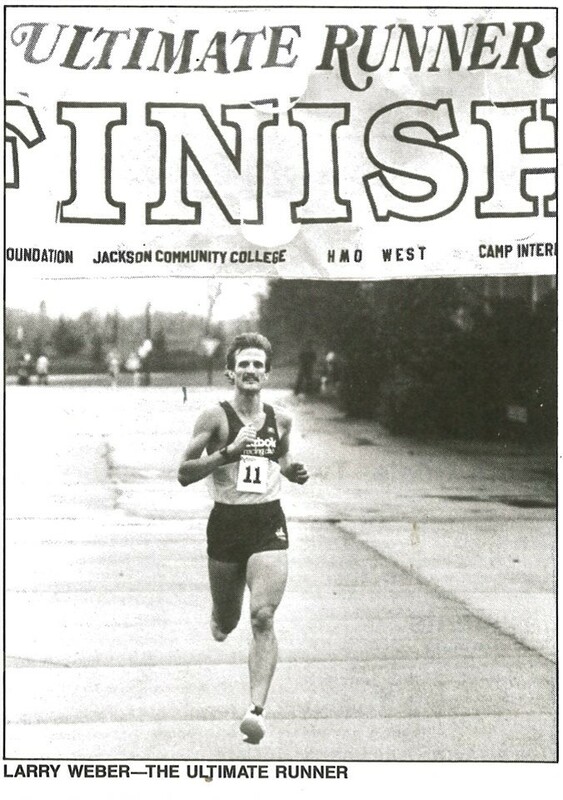 Runner's World Magazine writer Jim Harmon covered the race one year and had this to say about The Ultimate Runner: "This competition may be the last word in running endurance". Imagine for a moment running at nearly top speed for over 33 miles in one day. Running 33 miles at a fast pace in five different races is a level of pain that I had never experienced before or since this race. Some of the best ultra-marathoners in the world were attracted to the Ultimate Runner because it was one of the toughest running events ever created. These are pretty tough guys who think running 100 miles in a day is normal. One ultra runner in the race, Barney Klecker, still holds the American record for 50 miles to this day. "When Kardong heard about the Ultimate runner competition in Jackson, Michigan, of course he went. This diabolical contest has you run a 10K race in the morning, 400 meters, 100 meters, and a mile around midday, and for the afternoon, a marathon. Kardong is funny. He recalls passing a dead raccoon in the last couple of miles of the marathon, "I thought the roadkill looked better than I felt. “He placed fifth overall…". Olympian and famous running author Jeff Galloway competed in the event one year and said "I haven't had this much fun since Viet Nam". John Craig a semifinalist in the Olympic Games 1500 meters said the original Ultimate Runner was a great experience but he would never do it again because it was too hard on him. Kardong's humor sums up the event best. The race was brutally hard and there was nothing left in the tank when you finished the race. Galloway's comment tells you the same thing in a different way. The race turned out to be a battle of will from the very first step. National record holders in the ultra-marathon events, road racing champions, elite marathon runners, and Olympic athletes at 1500 and 5000 meters competed for the title of The Ultimate Runner at its peak in popularity. You could almost hear a pin drop at the beginning of the competition the day I ran the race. Every elite runner in the field was extremely focused and wanted to win this race. I was not on anyone's radar as a potential winner of the original Ultimate Runner race. However, I had an unspoken belief that I could do well. By the end the competition, I was crowned “The Ultimate Runner” setting an all-time record in the event. I finished ahead of several national and world class runners whom I had never beaten before. Winning the Ultimate Runner Competition took every ounce of mental, physical, and spiritual strength that I could find deep down inside that day. The meet officials had to lift me up onto the stage at the awards ceremony that afternoon to receive my first-place award because my legs were like jelly. Due to space limitations, I can’t share all the details of the many life changing experiences that I experienced that day. However, I can tell you that I prayed and focused like never before, learned to really trust God in the midst of physical pain, and most importantly began to understand the verse “all things are possible with God”. Looking back, my entire perception of fatigue and endurance was transformed during the competition as well. There is no question that we can all do a lot more than we initially think we can in the endurance and mental realms of life. In summary, The Ultimate Runner was the mental and physical test of a lifetime. I will always be grateful and cherish the opportunity I had to test the limits of human endurance when I was a young man. The event taught me so much about life—we can always do more than we initially believe. Keep pushing the pace to your dreams. Never give into pain along the way. You can do more than you think. All things are possible for those who believe.